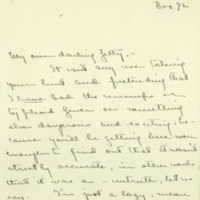 Eleanor Wilson McAdoo writes Jessie Wilson Sayre with news from Lyme, CT. It isn't any use taking your hint and pretending that I have had the mumps or typhoid fever or something else dangerous and exciting, because you'll be getting here soon enough to find out that it wasn't strictly accurate, in other words that it was a—untruth, let us say. I'm just a lazy, mean scamp as I always have been and always will be—and you haven't really been surprised at the lack of letters from me, have you? But I am working tho', Jeddydarlin, I'm not just sitting around holding my hands and refraining from writing to my angel sister. Oh, honey child, you don't know how much I'm missing you—it seems so queer to be here without you rooming all by myself. I don't think I'll ever forgive you that last week you've gone and stuck on. You're such a baddy. We certainly were glad to get your letters and know that you weren't completely stewed and weren't working yourself quite to death. I'm so glad you are really enjoying it all in spite of the weather, and oh, Jetty what fun that horseback ride must have been and what “scrummscious” things the riding man did say about you. You're a wonder, “and no mistake.” But if you go and decide to stay another day longer than the fifteenth I'm coming to get you, and when I'm there I'll kick up an awful row and tell the Bradfords what I think of them for depriving a poor, blameless family of their daughter and sister—which means you Perhaps if I hurry up and tell you how thrilling Lyme is this year you'll take the next train immediately. Well, there are about three artists here, one of them—German looking and rather harmlessly pleasant, the other a stick and married—(wife not here) and the third a stick. Then there is a bunch of women, which has changed its make up, but not its size, constantly ever since we arrived. At present there is Mrs. Robinson, Mr and Mrs Mason (don't ask me why I put him with the women, probably because they don't seem to be ever separated except at meals.) Mr. Perkins married sister —(minus the husband) two ladies from Hartford (one is a Virginian, alas, in the winter time) and the Wilsons. Tantchen has gone to Buffalo to visit Charlotte Mulligan, and the Smiths have departed for Ogunquit for two weeks. As for “our crowd” h-m-m, in isn't it? If I've left any out it's because their whereabouts or occupation hasn't been reported to me yet. (Oh yes, there's the fianceé—Mr. Woodhead—he's in Chicago—nobody seems to know as, as far as I can make out, what he's doing. But, as Mary Chadwick told me, “he'd probably be here for the wedding!”) I haven't seen much of any of them for the Sabines only arrived about a week ago, and I haven't sought the others. Seeing them at church is the most I've done. Which reminds me that the church is lovely, almost an exact copy. It certainly is a pleasure to go to it. Now about me, most important and inevitable subject. I waited a week “for luck”, and then dove into art. Its fun when I finally arrive at the impossible places that the class chooses to hide themselves. All of last week they went two miles away from here, that is—to the ferry and I nearly died of heat getting there. Really it was awful—two of the girls nearly had sunstrokes from it. So I went two days and the rest of the time painted up here and then took one small thing to the criticism yesterday. (Mr. Dumond said “Yes, thats pretty pretty nice”—and then tore it to pieces figuratively. It really is an awful joke—my painting at all, but, except in my blue times, I'm having fun daubing around. Mother is painting hard of courses and doing some ever so nice rock studies. Father hasn't been having much of a rest so far as he has had to go into New York a good deal for committees etc, but he's looking very well. Margie arrived safely on Monday, pretty tired out by her world travelling but is rested now. She left the houses Howes ! still getting settled, putting up mosquito nets and finding cooks etc. McAdoo, Eleanor Wilson, 1889-1967, “Eleanor Randolph Wilson McAdoo to Jessie Woodrow Wilson Sayre,” 1910 July 11, WWP17456, Jessie Wilson Sayre Correspondence, Woodrow Wilson Presidential Library & Museum, Staunton, Virginia.